St Francis of Assisi Anglican Church, 373 Milner Street, Waterkloof, 0181 Tel. +27 12 346 1106/7, Fax: +27 12 346 4226. Youth: Megan Winn; Children’s Church: Heather Napier. I was in the fortunate position of having too many articles for this edition of The Franciscan! This means that I now have 4 articles, already typed and formatted, waiting for the next one. Don’t let this dampen your enthusiasm – please continue to submit your contributions, so that the Advent/Christmas issue will also be a bumper edition. The main contribution in the present edition is the May Update of ‘Bridges of Care’ – our Social Outreach Projects. Many thanks to all who prepared these reports and especially to Erik Buiten who collated them. The work being done through these projects is truly inspirational. Well, half of 2007 has come and gone and, from now on, it’s downhill to Christmas! Firstly, no, this letter is not from your Rector, nor is this a coup d’état with me as deacon trying to take over the parish; but, because of Fr Tim’s preparation for his long leave, he asked if I would write this ‘Letter from the Rector’. By the time you read this, there is a very good chance that Fr Tim will be away at the Community of the Resurrection Fathers in Yorkshire, where he will become deeply steeped in the traditional Anglican spiritual discipline, gaining new strength for his work as Rector and Archdeacon, and at the same time drawing ever closer to God. We need to keep him in our prayers at this time so that he may return refreshed and even better able to continue helping us draw closer to our Lord. When Gary Player was taking part in one of his many US Opens, he hit his ball into a bunker just off the green. He took out his sand wedge and chipped in to win the Open. One of the spectators commented on what a lucky shot that was. Gary’s response to the spectator was: “It is amazing how much luckier I get with practice.” It is indeed amazing how, with practice, we seem to be able to get luckier every day! There are some people who are built to play a particular sport or do a particular activity. But speak to any sports person and s/he will tell you that the only way to improve one’s abilities is through practice, and the only way to sustain practice is through discipline. I am sure that there were days when Gary Player really did not feel like going out and hitting a golf ball, but he realised that if he was not disciplined in his practice he would never be at the top of his game. In today’s world of instant everything, discipline is a very hard thing to practise – instant food, instant relationships, immediate forms of communication. We expect to be able to pick up the phone and instantly have an answer to many of our questions. There should be no time delay, as we experienced in the days of letter writing. This goes for all communication, as letters have now been replaced with e-mails (some of you may even be reading this letter electronically), and so we expect the same to happen with prayer. But in today’s world, disciplined Christian lives are the exception, not the rule. We cannot say that this is how it has always been, because it has not always been like this. In the Anglican Church, we teach and practise a disciplined form of spirituality and this comes with the Liturgy; this liturgy does not only include the Eucharist, but also all the other services like Morning and Evening Prayer that are found in the Anglican Prayer Book. The problem is that, with our increased work loads, our spiritual discipline has diminished and we have started to have what we can only call ‘instant spirituality’. We look back at the Saints of old (and new ones) and desire the same kind of relationship that they had with God. The only problem is that we want it to be instant and we do not acknowledge the time that they spent on building their relationship with God. We dive in and out of instant formulas that are put to us in many of the books and programmes that have flooded the Church market and, in so doing, move away from traditional Anglican spirituality. This is one of the main challenges that Bishop Jo has put to his clergy and thus to all of us in the Diocese of Pretoria that falls under his guidance. This is that we are not to reinvent Anglican spirituality, but to embrace and practise that which has survived for 400 years. This challenge has been pursued through our teaching sessions of Advent and Lent. But we also need to encourage more and more parishioners to say Morning and Evening Prayer, or even to use other services like the Midday Office or the Angelus in praying for the country and against crime when the church bells toll at noon. Bell-ringing is also an old traditional way of calling the community to prayer. This discipline can also be furthered in one’s reading and studying – either by oneself or in Bible Study Groups (or whatever we want to call the different groups we belong to) – of works on traditional Anglican Spirituality. We will continue with the teaching on Anglican Spirituality during Advent this year and this will lead us to experience God in a new way. We will also be conducting a silent parish retreat that will be steeped in traditional Anglican spirituality. This will challenge us as individuals and as a community in our walk with Christ. We should also accept the challenge to take this new sense of discipline and deploy it through the rest of our lives – in our family life, our work and all our relationships. We may be surprised to find that a lot more will go right in these areas when we apply this discipline to them than previously was the case. May we as a congregation draw closer to God through our newly found old spirituality. What do we mean by Spirituality? Many people identify Spirituality with ‘piety’ or ‘other-worldliness’, or even ‘religiosity’. This I feel is far too narrow a definition, but this could be the subject of another article. Sufficient now to say there are many diverse spiritualities – mostly in a particular culture or an early formative influence – but here I wish to deal with our own form of Christian, and specifically, Anglican Spirituality. We are all spiritual beings, born with a divine spark within us, we all have a spiritual dimension, we are made in the image of God, but this spark must be nourished and fed in order to grow into a conscious relationship with God – it must be quickened by the power of the Holy Spirit. Spirituality includes then, not only theology and prayer, but also the practical outworking of our Christianity in all areas of our lives and in community. Spiritual progress is not measured by visions and thrills, but rather by the faithful fulfilment of the duties of one’s particular state in life or calling, whatever it may be. We must implement the words of Jesus, who said: ‘You shall love the Lord your God with all your heart, and with all your soul and with all your mind, and you shall love your neighbour as yourself.’ Jesus, in his ministry, was concerned with and dealt with social issues. He was concerned with the poor, the sick and the hungry. I believe that we are very blessed in the Anglican Church to have great riches to draw upon in order to grow, to help us achieve our goal, to help us live continually in the presence of God, who is not only transcendent, but also immanent, very much involved in our world. As Anglicans, we have built on the three pillars of Holy Scripture, Tradition and Reason, thus giving ourselves a strong and balanced foundation. The seven canonical hours, as they are known – Prime & Lauds, Terce (3rd hour), Sext (6th hour), None (9th hour), Vespers and Compline at bedtime – are now reduced in today’s world, for practical purposes, to Morning and Evening Prayer. You may remember from the Acts of the Apostles that the followers of Jesus were gathered together ‘at the 3rd hour’ when the Holy Spirit came upon them. We read that Peter went up to the housetop to pray ‘at the 6th hour’ and again Peter and John had gone up to the Temple ‘at the 9th hour’ when they healed the lame man. Clergy are obliged to say the two offices of Morning and Evening Prayer every day along with the relevant Scripture readings and psalms. It would take too long to go into the whole history of the Anglican Prayer Book here, but, as it has come to us today, it can, in conjunction with the Bible, meet the needs of every occasion, and is available in Afrikaans and in several of the other nine official languages spoken in South Africa. All Anglicans should own their own copy of the Anglican Prayer Book in the language of their choice. Apart from the two offices of Morning and Evening Prayer, which themselves are rich in collects, canticles, psalms, litanies, prayers and readings from Scripture, the APB contains 4 Eucharistic Prayers, where we are fed with Word and Sacrament. The Sacrament of the Holy Eucharist is the central act of the Church’s worship, along with liturgical prayer, the prayer of the people. The APB also contains forms of service for every occasion, from baptism to burial, and prayers concerning every aspect of life, living and dying. The Church in her wisdom has given us Holy Days in order to remember some of the great Christian Festivals and events, as well as the calendar of the Church’s year, which begins with the start of Advent, taking us through Christmas and the Epiphany to Ash Wednesday, Lent, Good Friday and Easter, Ascension Day, on to Pentecost (that important day when the Holy Spirit came upon the disciples as they were assembled together) and Trinity Sunday, which focuses our attention on one of the central teachings of the Christian faith, that the One God whom we worship exists in three Persons, Father, Son and Holy Spirit. The season of Trinity covers many weeks during which the general teaching of the Christian Faith is systematically covered. Each Festival or Season has its own specific liturgical colour: red for the blood of martyrs and the Holy Spirit, Purple for Penitence, e.g. Lent and Advent, White for special celebrations or seasons, green for growth, for days when there is no special celebration, also know as Ferial Days or Feriae. Because Worship is central to our Faith, we use what I would call ‘aids to worship’ in the form of candles, flowers, sacred music, art, stained glass windows, vestments, architecture and incense, all helping to make an atmosphere conducive to raising our hearts in praise. I suggest that, along with your Bible, each person should have copy of the APB and so enrich your prayer life by using the Offices with the relevant passages from Holy Scripture to be found in the Lectionary, which is available through the parish office. May God bless us all as we make our pilgrimage through this world. The first man used to lie in his bed and imagine all the wonderful things the second man described to him. One day the second man died. The first man was sad and disappointed. After a few days he asked the nurse to move him to the bed next to the window. She did. He levered himself up onto his elbows, which caused great pain. He looked out of the window. He saw a brick wall! The man was blind, but he did his best to spread a little happiness. I was the one who persuaded Paddy to let me publish the article about him. It was brought to my attention and I felt it warranted publication in the Franciscan, because I felt it so powerfully summed up the man (Paddy) I know and have known for probably 30 years. Few (of the new generation) are possibly aware that Paddy, one of our lay ministers, has been a member of this Parish for decades. He has seen the likes of me come and go (and will probably continue to do so) and in this time, if I have one image of Patrick Telford, it is of a faithful Christian servant who has brought hope, joy and the very presence of his Christ into the lives of thousands – in so many, many ways. 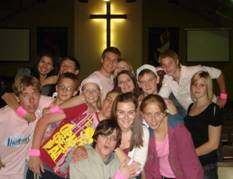 He was for many years the Diocesan Youth Leader and ran (amongst other things) what was probably the most successful suburban Youth Group of the Diocese here at St Francis of Assisi. Uncomfortable as he was with my decision, I’m pleased to have persuaded him to let Jill (our editor) include it – and I’m grateful to him. God be with you my beloved brother. I am hoping that this Bulletin will serve as a means of communicating more effectively about parish and diocesan activities. Firstly, as read out recently at the Sunday services, our very own bishop has been nominated for the office of Archbishop of Cape Town; as was requested in the Ad Clerum, please continue to pray for him, Timeya and the rest of the family. The Archbishop’s office has informed us (for general prayer) that Father Professor Barney Pityana (Vice Rector of Unisa) and the Rt Revd Thabo Makgobo of Grahamstown are also in ‘the running’. Our prayer is that God’s will be done in this matter. Secondly, on my request to our new Dean, the Very Rev Canon Livingstone Lubabalo Ngewu, to provide us with a short profile, he reminded me that in fact there had been one in the previous Kingdom, I refer you back to this. After what seems an interminable period (certainly if you have been living and working in the midst of it), the renovations to the parish centre (including the courtyard and the toilets for the disabled) are mercifully coming to an end (though I warmly thank Pebblestone Projects for their highly professional and own gracious patience throughout). Council agreed that canonically the Diocesan needs to be invited to bless what our Treasurer rightly called ‘a whole new parish centre’. To this end, I have managed to book the Bishop for Friday 28 September (our Patronal Festival Weekend). Please diarise this event now. Let us have this centre chock-a-block for this momentous occasion. In the meantime, to celebrate the completion of the project (you will hear loud alleluias from the parish office), the idea is that on the evening of the 27th July at 7 p.m. a ‘roof-wetting’ party will take place. On the Missionary front, you may recall that we are going to help the good people of Refilwe complete their parish church. There is a delay in this, though I am hoping that my meeting on site with a few pertinent parties will go some way to resolving the impasse. I am exceedingly proud that at the heart of the Diocesan Social Development work Hank Doeg (a 07:30 parishioner) is to be found. Hank is going to do an article on this area of ministry for The Franciscan, but he is also in the process of producing a fairly regular update in the pew leaflet. Equally pertinent in this regard is the work of Chana Majeke, Erik Buiten and the rest of the Parish Social Development Team who have given me some excellent ideas – these too I will convey via the bulletin. Further on the Missionary front is that this parish has formed visiting teams under the able leadership of Fr Heath and the idea is that these teams will complement the visiting strategy in the parish – this is an initiative inspired by the Diocesan’s 3-year Mission and Evangelism programme. Please know that you have, by your kind generosity through the St Francis special collections, brought warmth in these cold times. Blankets have been purchased and donated and June’s Craft Group was given a sizable amount to enable them to buy tracksuits for the Tumelong Orphans. It has also enabled me to give temporary employment to two people whose work in fact has proven to be invaluable in all kinds of ways – not least of all the dignity it affords them. We have booked Irene Homes for a ‘Day Retreat’ on the Saturday 13 October 2007. Please book this in your diary, we will give you more details when available. We have also booked St Alban’s College for a weekend retreat for the first weekend in August 2008, again details will be forthcoming when arrangements have been made. Some of you will have noticed a ‘Red Candle’ in the sanctuary. Its presence was explained in the pew leaflet a few weeks ago, but by way of update I will ‘re-enlighten’ you. I got the idea from Bishop Ruben Phillip in Natal who has asked that each parish in his diocese have a lighted red candle at the Sunday Eucharist as a visible symbol of the fight against crime. (Very much like our own initiative of bell-ringing at midday, which his diocese is doing as well, along with many others.) As you see the candle flickering, please add your own prayers, Sunday by Sunday. Finally, in the mad milieu which is my life, Council approved that I take six weeks Sabbatical which will include the month of August and two weeks in September. Bishop has approved (he wanted me to take three months, God bless his soul and I am sure he had your interests at heart), but I am pleased to tell you that I will be spending the bulk of it with the Community of the Resurrection Fathers at their House in Mirfield, Yorkshire. (You may want to look them up at mirfield.org.uk and you will see that it is rather a delightful place – which I am hoping will afford a glorious time of R & R, with a little bit of work thrown in.) I have arranged with the Bishop and the Fathers that I will produce a short a ‘mini thesis’ on Anglican Spirituality. Anything more intense will detract from the refreshment side of things, so I am grateful for the Bishop’s ‘laxity’ in the matter. The last two weeks are even more exciting, as far as I am concerned, because Nina and I will spend some time together (for our 25th Wedding Anniversary) with her mother in Italy. I believe a night in Assisi is on the cards and that can be no bad thing. The living proof that God is in all of this is that there will be no children tagging along. Many blessings and I hope you find this format useful. By the time you read this, you might have become accustomed to seeing me in the Sanctuary at St Francis now and then. Some of you may have wondered who I am and where I came from. This serves to tell you a little about myself. My name is Sheila Cave. I have been married to Rodney Cave, my second husband, for thirty years. We have six children, twelve grandchildren and one newly-born great-grandchild between us. One of my sons (John) and his three boys live with Rodney and me on a permanent basis. I grew up in Johannesburg, attending Johannesburg Girls’ High School. I attended Johannesburg College of Education and taught in junior schools, first in the Lowveld and later in Pretoria and Irene. Along the way, I became a committed Christian. I believe all Christians are called to serve in some way or another. I therefore became a Sunday school teacher in Barberton, where I then lived. Later I became a Lay Minister at St Martin’s Church in Irene. I was ordained as a Deacon in 1998, also while a member of St Martin’s. A year ago, Rodney and I moved with John and his sons from our home in Irene, where we had lived for twenty-five years. A new six-laned throughway is planned for Alexandra Road, where we lived, and the prospect of all the traffic which would pass our doorway every day was too awful to think about. Because John wants his boys to go to Pretoria Boys’ High (where both John and his father, Stanford Todd, went to school), I hunted for a house in the area zoned for that school. We finally settled on a large old house in Julius Jeppe Street, where we all feel very comfortable. For six months, I continued to serve as deacon at St Martin’s, but eventually the family decided that it was better for us to break ties with our church family there and join St Francis. We started attending church here at the beginning of 2007. The Bishop and Father Timothy graciously agreed to let me continue my duties as deacon here. I would like to thank all those people who have been so charming, friendly and welcoming in our new church home. We are happy to worship at St Francis, and I am happy to be of some use in the Parish when I am needed. When I was invited by Heatherlynn Lewis to join Colette Donkin and Melanie Gardner for coffee at the Milner Street café, I was delighted. We were to discuss the church hall, which was to become the new Parish Centre. Their ideas and enthusiasm and, with the help of their architect, the new design and new look, all sounded quite wonderful. So much attention to detail! 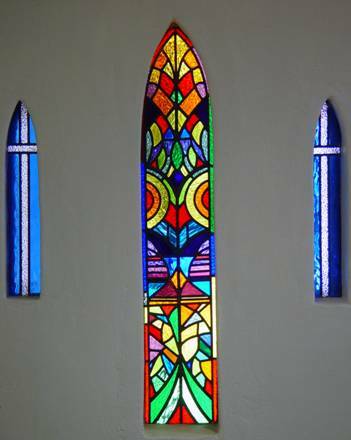 Melanie wished to be involved in the making of the stained glass window. It was to be quite small. She asked me to do the design. I was thrilled and terrified at the same time, but when I sat down that evening with some aquarelle crayons, ideas seemed to flow. I felt quite inspired, some higher force driving me. I was quite pleased with what appeared, although I did wonder what it would look like when blown up to the correct size. (How amazing is technology today – this little drawing was enlarged to the exact size of the window.) Melanie and a friend were able to cut the glass exactly – the colours exquisitely beautiful. I had spoken to Martzi Eidelberg about the colours and she stressed that ecclesiastic colours should be used. We had all decided that a design would be preferable to any figures. The liturgical colours are purple for penance and Advent; white or yellow for Heaven and celebration; red for the Holy Spirit and the blood of martyrs; and green for growth and the ordinary times of life. Blue is not a liturgical colour, but is regarded as a holy colour, being associated with the Virgin Mary. I decided to design a tree of life depicting growth, our wondrous earth, the creation, the resurrection. I started with the roots and the soil, the flowers, the leaves of the trees, the life sustaining water and the sea, the sky, sun and moon, sunset and sunrise, all reaching upwards. In fact, I thought, people could decide for themselves what they found in the little window. The sun shining through the glass is in itself so very beautiful and inspirational. Wow, I can’t believe we are already half way through the year! What a busy second term we have had. Oasis took part in the Willows Methodist Annual Dodgeball Tournament. 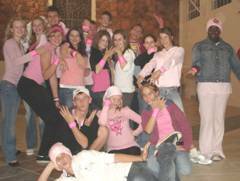 We had 4 teams that took part: 1 Girls’ team – The Pink Ladies; 2 Guys’ teams – Pink Panthers and Men in Pink; and 1 Mixed Team – Pretty in Pink. All our teams did very well and the Pink Panthers won their division. So special congratulations to them. Our worship team has expanded to welcome 8 new members with varying musical skills and we’d like to welcome them on board. We also took part in the Bishop’s Youth Day on 16 June, which was held at the cathedral, and I’d like to thank those who went along. It was great and very interesting to hear what other parishes in our diocese thought. Our term ended with a Bring ’n Braai and then, from 25 – 29 June, we joined Brooklyn Methodist for the holiday club. The theme was Barnyard. We taught the kids many lessons about God’s Family, God’s Boundaries, God’s strength, God’s Love and God’s Style. It was thoroughly enjoyed, and I think even more fun was had by the leaders. I would like to thank Chrispie, Mina-Moo, Bessie, Woody, Postie and Maggie for all their hard work. I also want to thank all the St Francis kids who came and supported us – you guys ROCK!! I pray that God has kept you all safe and warm this holiday and that He brings you back safely into the new term, which I am so excited about! God bless. At 63 years of age, Calcamite’s chief executive, Paddy Telford, has seen a lot of changes in his lifetime, although not all for the better. ‘I remember the early days when a business deal was concluded only with a handshake,’ says the man who believes that transparency and honesty are the best attributes needed to run a business. With a track record of 122 000 single treatment plants (septic tanks) successfully installed, at an average of 600 per month since 1989, one has to believe that he knows what he’s talking about. Telford is softly spoken, with a very humble demeanour. His monotonous tone defies his many years of experience, both as a tough businessman and an activist. 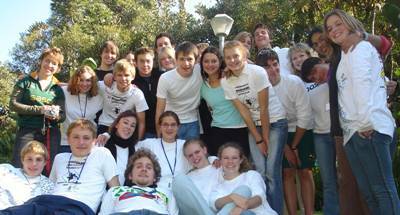 As the youth director for the Anglican Church in the 1980s, Telford spent a great deal of time in the rural settlements of the Pretoria Diocese and got to know of the suffering people underwent on a daily basis. ‘A part of my responsibilities was to prepare black and white youth for the collapse of apartheid.’ Telford’s unemotional tone betrays the underlying sense of pride the statement carries. When cyclone Demoina devastated Natal in 1984, the majority of rural settlements were serviced with pit latrines, which were just holes dug into the ground, or bucket systems. The flood created havoc: ‘I saw effluent flowing down the street – it was sad to see the inhumane conditions in which people were living,’ he says, exposing his softer side. As his contribution to the clean-up effort, Telford developed a latrine that started as a longdrop, but was upgradable to waterborne sewage, and which was termed the ‘dignified pit latrine’. As a result, Calcamite has had a positive influence on the lives of one million people. 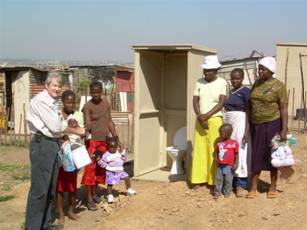 He has been involved in ‘bringing dignity to the rural areas’ through sanitation ever since and is presently part of the government’s drive to replace all bucket toilets by 2008. ‘Our involvement is mostly in the rural areas and informal settlements throughout the country, especially where there is no waterborne sewage.’ He adds that Calcamite also works closely with several municipalities and provincial governments in providing septic tanks. Being the great grandson of the very first chief architect in the Republic, Sytze Wierda, Telford has creativity and innovation in his blood and does not disappoint. Calcamite’s reach into Africa has expanded over the years and still continues to grow. 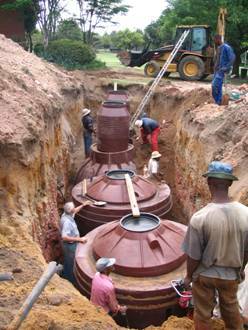 ‘Our tanks have been exported to all SADC countries, as well as Uganda and the Democratic Republic of Congo (DRC).’ […] Calcamite is also currently supplying toilets and technology for a large environmental project in the Okavanga Delta in Botswana. · Visit www.calcamite.co.za for more information.